Texas Attorney General Ken Paxton charged with fraud. 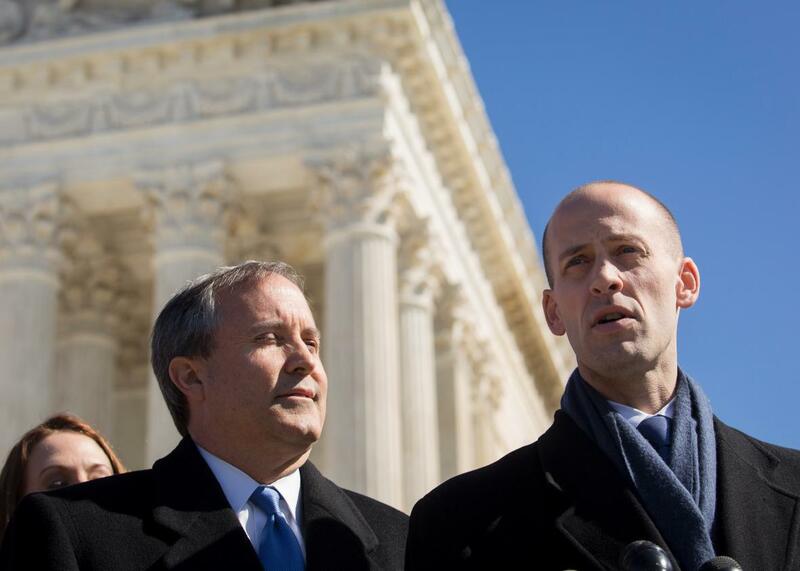 Ken Paxton, Attorney General for the state of Texas, and Scott Keller, Solicitor General for the state of Texas, speak to the media at the Supreme Court, March 2, 2016 in Washington, D.C.
On Monday, the U.S. Securities and Exchange Commission filed charges against Texas Attorney General Ken Paxton for alleged acts of securities fraud. According to the federal regulators, Paxton raised $840,000 for a tech startup while he was a state legislator—without disclosing to investors that he was being compensated to boost the company, as is legally required. A Texas grand jury indicted Paxton last year for felony fraud over the same alleged misdeed of making secret commissions. If convicted, Paxton could face years in prison. He denies all charges—though in 2014, he did admit to illegally acting as a securities broker without registering with the state.